1 1. Shut off power to furnace or air handle. Remove door and remove dirty filter. 2 2. 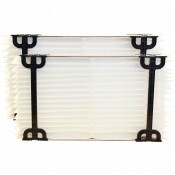 Open new filter and attach the four side support bars as shown in the installation pdf. Note: Make sure support bars snap into notches on cardboard top and bottom. 3 3. Slide assembled filter into cabinet. 4 3. Replace door and turn on the power.